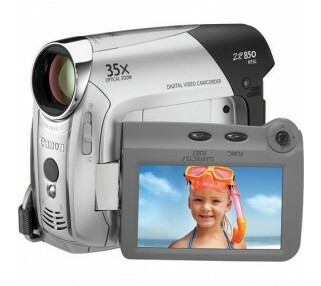 Rent this Canon ZR850 video camera for inexpensive video creation. Put still shots on an SD card. This digital Mini DV camcorder rental is great for simple and affordable video creation. With its easy to use consumer digital camcorder you will be videotaping in seconds. The EASY mode and the joystick menu system are user very friendly. This Canon produces vivid colors and sharp pictures in a very small package.